Contacts are significant for all phone users because they provide the communicated channels and allow you to contact others just with a click. In the same way, text messages are also important since they record a lot of information during the chatting day-to-day. However, once you have deleted the contacts by accident, you need to ask your friends again and type the phone numbers one by one. If you lost text messages, it's difficult to find them back. Well, you can take it easy now. Here in this article, an efficient Android data recovery tool will offers you the solution. 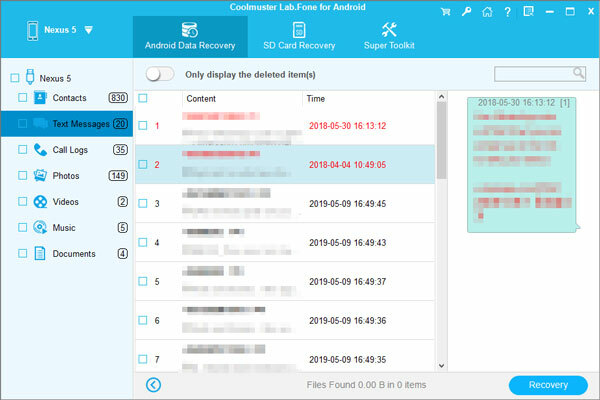 Coolmuster Lab.Fone for Android is a powerful and easy-to-use Android Data Recovery program that enables you to scan your lost contacts, text messages, as well as photos, videos, music from both Android SIM card and Android SD card automatically after you connect your Android phone to the program. It is fully capable of retrieving deleted, lost and formatted contacts and text messages from Android SIM card, with the contact phone numbers, job title, email address, company name and other information perfectly kept after the recovery process. This Android SIM card data recovery will recover everything from the most Android phones and tablets, such as HTC, Sony, Samsung, Motorola, LG and Huawei. Download the trial version of Lab.Fone for Android to have a try. How to Restore Lost Contacts and SMS Messages on Android SIM Card? All files, both in your Android external SD card and SIM card will be scanned out automatically and listed on the left side-bar. Just open these folders and check the contained files one by one on the right window. Click "Contacts" and "Message" icons and preview them one by one. Select those you want to restore and click the "Recovery" button to save the recovered Android contacts and text messages on your computer.